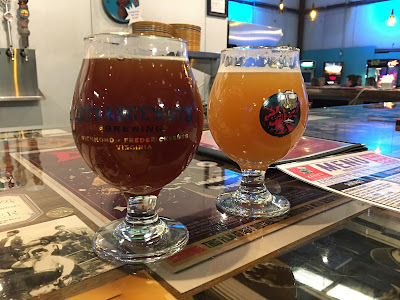 After I returned from very fun morning at the range, we headed over to Strangeway's Brewing to relax with some good beer and food. Colleen had noted an announcement on Facebook earlier in the week about some new releases on Saturday which sounded too good to pass up. One of the new beers, and the one that grabbed her attention was Basic Honey B Bourbon/Port Barrel Imperial Honey Ale. The beer is brewed with Virginia honey and Copper Fox Distillery’s applewood smoked malt, and aged in A. Smith Bowman barrels that had been used to age bourbon and port. It was a truly Virginia-bred beer. The ale brought forth caramel, dark fruit, with a smoky bourbon punch. Colleen's short review, "Oh, I like this." As tempting as this one sounded, another release Aardvarks for Math! Coffee IPA, grabbed my interest. The beer is flavored with local Dier House Coffee Roasters Burundi Blend coffee. This "juicy roast" with notes of raspberry and cherry compliments the citrus hops very nicely. I've been intrigued by the use of coffee in hoppy beers like Pale Ales and IPA's, instead of the typical dark Stouts. Unlike the very strong coffee flavors found in Cocka Doodle Brew Coffee Ale from Parkway Brewing, this one still had the bitter citrus flavor of an IPA. The coffee influence came out in the finish with hints of dark chocolate and bitter tea. I very much enjoyed it. Of course, we were there for food too. The Zesty Adventurer food truck was on hand supplying tasty Mediterranean influenced dishes. We started off with a Hummus platter with carrots, celery and warm pita bread. For our main course, Colleen decided on the Chicken Gyro Sandwich, while my palate had a craving for Mediterranean Quesadilla. The food was very flavorful and freshly made. Not only was the food delicious, it was a great value for the money. Convenient ordering was handled inside and the food was delivered right to our seats at the bar — no need to venture outside and then carry the food back in. We'll definitely watch for more local visits from The Zesty Adventurer. A couple more beers were needed to linger over and enjoy with our meal. Picking beer at Strangeway's is always a challenge, with nearly 50 taps too choose from. I eventually decided on La’ Agora Oak Fermented Farmhouse Ale. 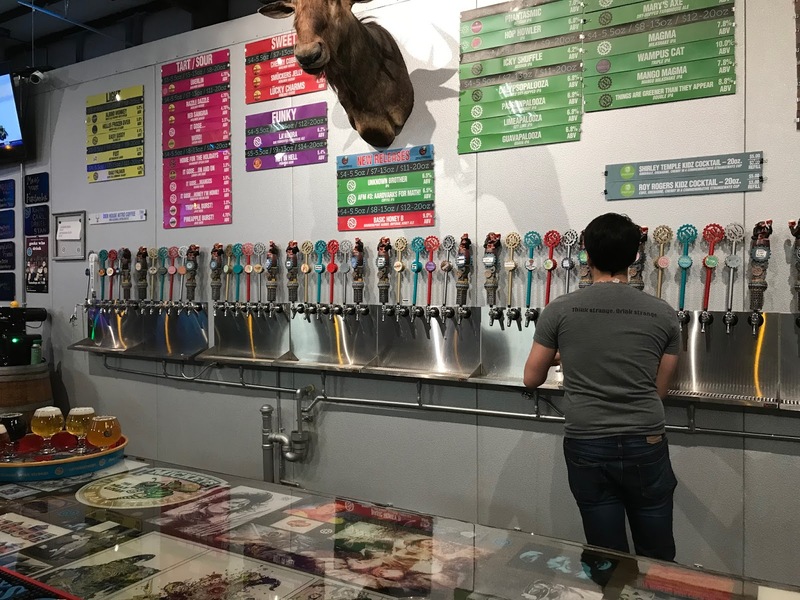 Colleen opted for Mango Magma Mango Milkshake IPA. Interestingly, those style selections are totally reversed from our usual preferences; we're good influences one another it seems. Tasty selections on both accounts.